Enhance your relationship with your customers and make more profits simultaneously using our diversified Offers and Schemes based on products, categories and customer type, as well as for selective batch or lot. Take orders, create receipts and bill on the go! With access to real-time stock, offers & bill-wise outstanding details, your rep can order more & collect faster. Performance analytics, route planning and a daily dashboard helps drive better productivity. Comprehensive software solution for multiple location sales and distribution business to manage their entire down stream supply chain management like C&A / C&F, stockists and super-stockists. The loosely coupled web based solution helps you to manage your chain network and take informed decision from anywhere with complete visibility on sales and Stock. 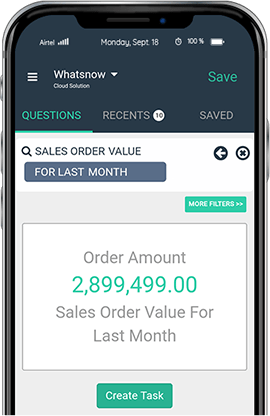 Make data backed decisions with real-time reports on your phone anytime, anywhere with the Owner's Reports App WhatsNow.